This post is taken from a page here within this site – it MAY not have been seen because it’s in a page. 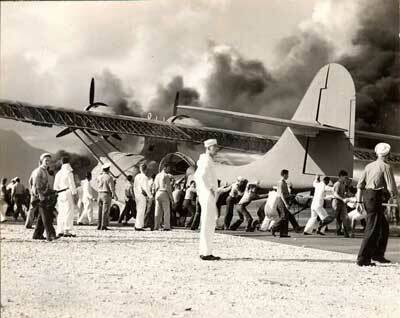 Some years ago I was sent these photos from the time of Pearl Harbour to add to this site. Isn’t is amazing how a film could last so long in a camera without disintegrating fantastic photos taken 68+ years ago. Some of you will have to go to a museum to see what a Brownie camera looked like. Earlier this year I was also shown a post of a digital camera that had been under water – that post is on my other blog! Here is an example – see the slide show below for more. . . These Pearl Harbour photos are absolutely incredible…. Pearl Harbor On Sunday, December 7th, 1941 the Japanese launched a surprise attack against the U.S. Forces stationed at Pearl Harbor , Hawaii By planning this attack on a Sunday, the Japanese commander Admiral Nagumo, hoped to catch the entire fleet in port. At 0753 hours the first wave consisting of 40 Nakajima B5N2 ‘Kate’ torpedo bombers, 51 Aichi D3A1 ‘Val’ dive bombers, 50 high altitude bombers and 43 Zeros struck airfields and Pearl Harbor Within the next hour, the second wave arrived and continued the attack. USS Arizona (BB–39) – total loss when a bomb hit her magazine. USS Oklahoma (BB–37) – Total loss when she capsized and sunk in the harbor. USS California (BB–4 4) – Sunk at her berth. Later raised and repaired. USS West Virginia (BB–48) – Sunk at her berth. Later raised and repaired. USS Nevada – (BB–36) Beached to prevent sinking. Later repaired. USS Pennsylvania (BB–38) – Light damage. USS Maryland (BB–46) – Light damage. USS Tennessee (BB–43) – Light damage. USS New Orleans (CA–32) – Light Damage..
USS San Francisco (CA–38) – Light Damage. USS Raleigh (CL–7) – Heavily damaged but repaired. USS Helena (CL–50) – Light Damage. USS Honolulu (CL–48) – Light Damage..
USS Downes (DD–375) – Destroyed. Parts salvaged. USS Cassin – (DD – 3 7 2) Destroyed. Parts salvaged. USS Shaw (DD–373) – Very heavy damage. USS Helm (DD–388) – Light Damage. USS Ogala (CM–4) – Sunk but later raised and repaired. USS Curtiss (AV–4) – Severely damaged but later repaired. USS Vestal (AR–4) – Severely damaged but later repaired. USS Sotoyomo (YT–9) – Sunk but later raised and repaired. Share this with your Loved ones of ALL ages….Elderly will remember, Young will be Awed.